Let’s imagine it’s after bedtime on Halloween night. The kids have gone trick-or-treating, and hopefully they came home with a good supply of safe sweets and non-food treats from all the compassionate households with teal pumpkins out front. You finally wrestled your little princesses and goblins into bed despite the excitement and the sugar rush, but you can’t complain because this has been one of your child’s best Halloweens yet! 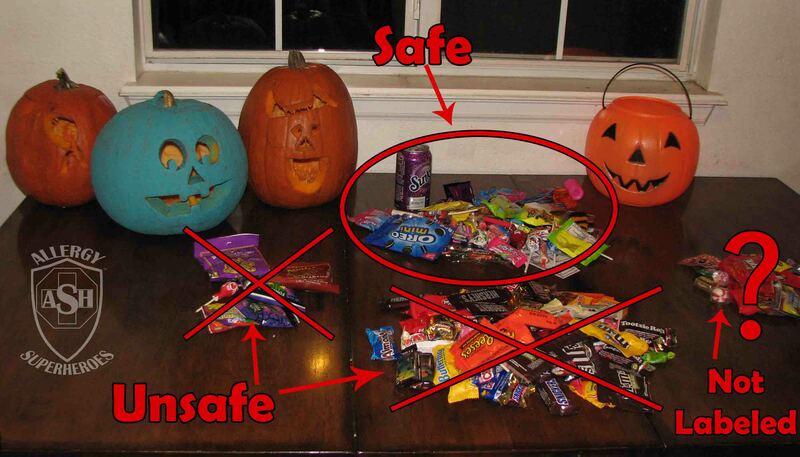 Now that they are finally asleep, it’s time to implement your plan for getting rid of the unsafe candy. It’s a good idea to decide what to do with that candy ahead of time so you aren’t scrambling Halloween night. Plus, you’ll be calmer and less likely to make a mistake if you’re prepared ahead of time. 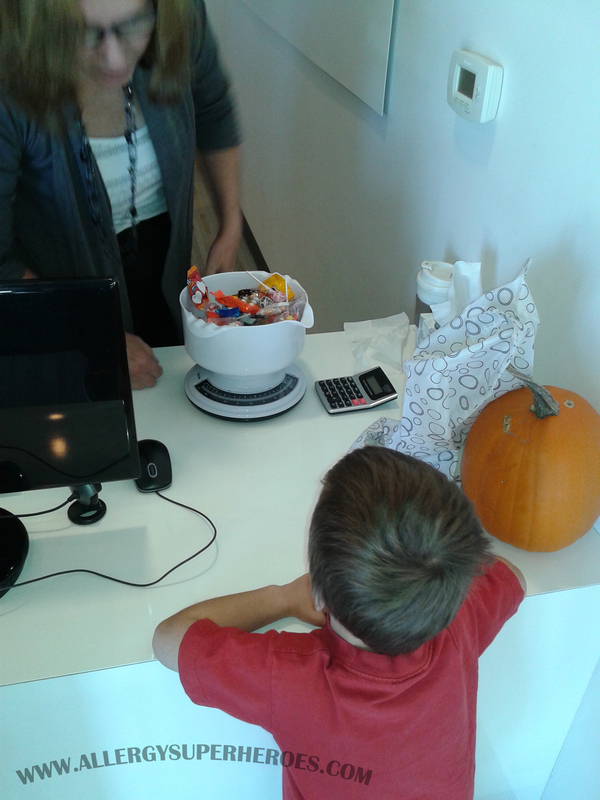 There are two parts to making your plan: getting the candy away from your child, and deciding what to do with it. There are lots of ways to do this. If your child is old enough and aware enough to know that some candy can hurt them, this is usually not too difficult–they don’t want an allergic reaction any more than you want them to have one. In our house, we just tell our kids that we’ll sort their candy and take out everything that’s unsafe, and that’s the end of it. Someday (perhaps even this year) we’ll even include them in this process, to help them recognize unsafe brands and learn to read labels. 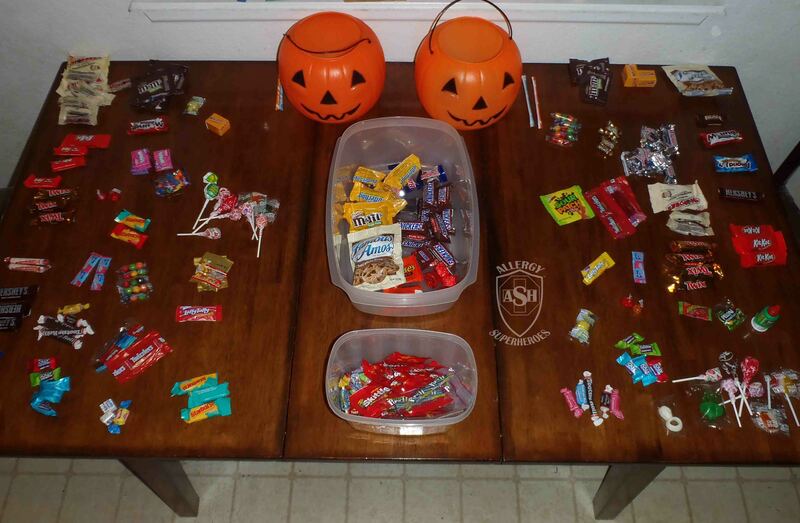 Performing a “candy switch” through a Switch Witch or other method, in which kids set out their unsafe candy at night and they find a fun surprise in its place the next morning. The Switch Witch is a public domain entity, and I know a family or two who does this anonymously and succinctly. There are also a handful of companies that encourage this practice by selling a story and toy combo, similar to the Elf on the Shelf. Please don’t throw your candy away! Eat it yourself. If you’re comfortable keeping allergens in your house and this candy is something you enjoy, there’s no reason not to indulge from time to time. Be sure to keep it in a safe location, though! Bring it to work. Candy or food left in the break room will get eaten. It has been this way at every job I’ve ever held. Give it to a friend, neighbor, family member, etc. Especially if you have a lot of their favorite brand. Donate it to a food bank. Sell it! I have been a staunch supporter of the Halloween Candy Buy-Back Program for years (I’ve blogged about it here.) Go to the website to find a participating dentist near you, bring your unwanted candy to them, and they’ll pay you $1 per pound of it. You can let your kids have this money if they’re involved in the process, use it to fund the replacements you purchased, or find another use for it. And as if this payment wasn’t enough, the dentists then forward the candy in the form of care packages to our deployed troops through Operation Gratitude! If you’re new to food allergies, or if you’ve always felt overwhelmed by the onslaught of unsafe sweets on Halloween night, I hope this will help you make a plan so you can feel on top of things this year. And I hope you find lots of teal pumpkin houses in your neighborhood! What do you do with unsafe candy? Will you try any of these options this year? Next → Next post: Exciting Teal Pumpkin Products!